The F8 Tributo is a tribute to the rich history of the Prancing Horse in motorsports and an invitation for Ferrari drivers to step into the driver seat with confidence. 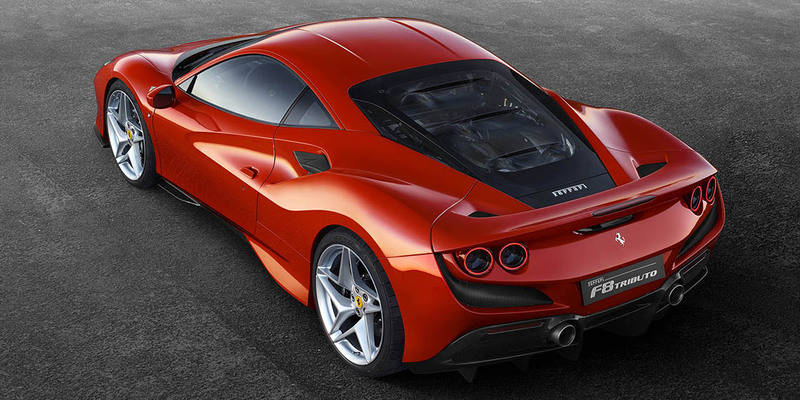 This mid-engine two-seater berlinetta hugs the road thanks to SSC 6.1 and improved aerodynamics. The thrill of the journey to Roosevelt National Forest is palpable as you grip the, newly designed, steering wheel. The unmistakable deep roar of the F8 Tributo engine may be the best enhancement to the Ferrari experience. However, the extra horsepower maxed at 710hp, top speed of 212mph, and 0-62mph in 2.9 seconds are outstanding enhancements too. The improvements to the F8 Tributo are all designed with the driver in mind. The cockpit style dashboard optimizes driver’s controls and with one glance the Mile High City skyline fades in the distance. The tremendous power and speed of the F8 Tributo is a result of enhanced aerodynamics. The front S-Duct increases downforce and front air intakes improve air flow and cooling of the brakes. The radiator packs are tilted towards the rear and side air intakes allow for further reductions in temperature. Drivers and spectators delight in the curvature of the body and low center of gravity. But, the rear of the F8 Tributo is the best view. The rear blown spoiler spans the width of the car and encompasses the twin tail lights to further create downforce and reduce drag. The highlight of the back is the Lexan tri-louvres screen, reminiscent of the ever-famous F40, that displays the impressive V8 turbo engine. Performance is meaningless unless it is accessible to the driver. Advancements in performance were intended to benefit the person behind the wheel. The F8 Tributo is not only exhilarating to drive; it is enjoyable and comfortable at any speed. The engine is highly responsive and suffers Zero Turbo Lag throughout the 8,000 rpm range. Additionally, the F8 Tributo is 88 pounds (dry weight) lighter than the 488 GTB. Side Slip Angle Control (SSC) 6.1 allows drivers to safely enjoy the F8 Tributo’s impressive performance. Switching the manettino to RACE mode now allows the driver to access Ferrari Dynamic Enhancer (FDE). 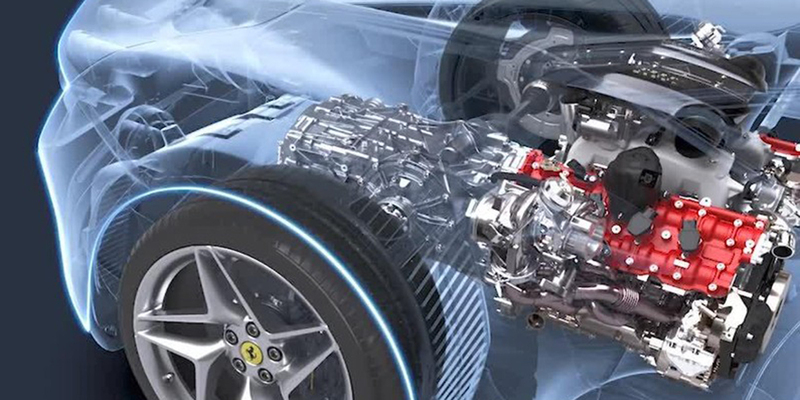 Maximized efficiencies allow Ferrari enthusiasts to revel in the full capacity of high performance. This Ferrari two-seater berlinetta provides comfort and luxury during high-powered driving adventures. Sophisticated innovations in and outside the F8 Tributo were designed with the driver in mind. Inside the cabin, most notably, the new, more-compact steering wheel with mounted controls, allows for increased steering agility. The classic instrument cluster includes the rev-counter and infotainment center. 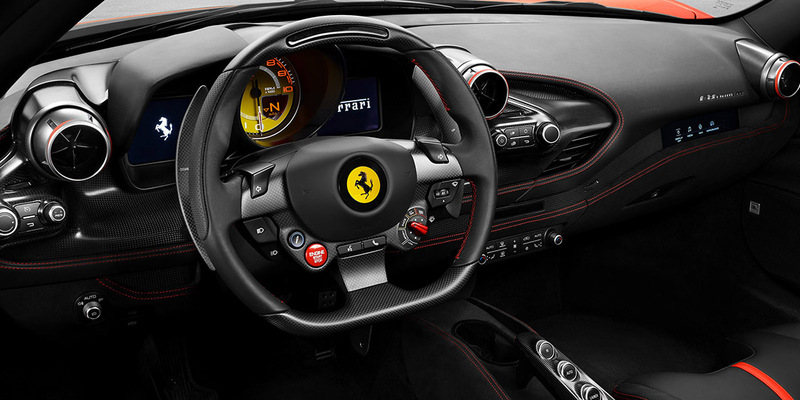 The leather, aluminum, and carbon fiber dashboard is highly sophisticated yet has a streamlined lightness. There is an optional 7” touchscreen that can be included as the passenger-side display. Pilot and co-pilot are transported by the adrenaline inducing sound of the V8 engine as they race down the pavement.